Want to get some more reviews in. I figure since we just finished this one it was a great choice. Getting to play AD&D at the height of its popularity was one of the best things about growing up in the 80s. Even living in a small town in Central Illinois there were multiple, independent D&D groups going on everywhere. It was not uncommon to hear talk of an adventure, or a rules debate or anything else. One of the adventures that everyone seemed to be playing was the Against the Giants series. Talk of Ombi, King Snurre Ironbelly, and Eclavdra were not daily topics of conversation, but they were common enough that there was a shared set of experiences. It was something we all could relate too and talk about even when we knew those other groups were playing it all "wrong"! 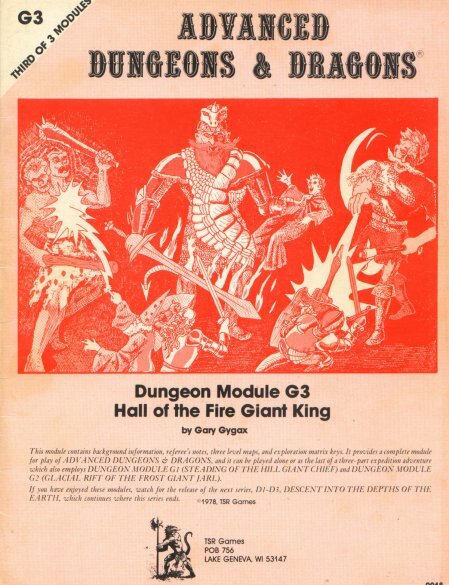 It is no surprise then that G1-3 have been ranked as some of the greatest *D&D adventures of all time and have been updated for every version of the D&D rules since it was published back in 1978 (and combined in 1981). The Giants series began as three individual adventures. They were run as part of the AD&D Tournament at Origins '78. 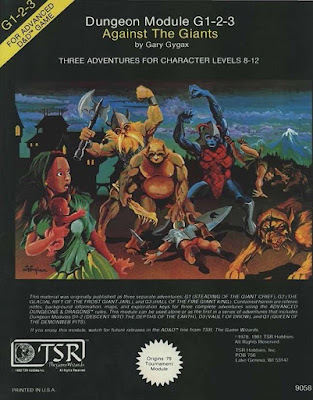 When later released they became the first ever published adventures for the then new Advanced Dungeons & Dragons (AD&D) game. 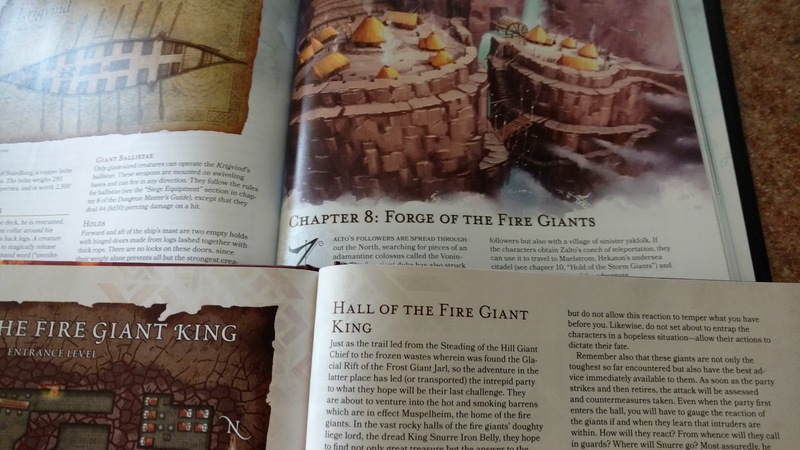 Each adventure dealt with raids from a different race of giants; Hill, Frost and Fire respectively. They were aided by other giants and giant type creatures including ogres, stone giants and even a couple of white dragons in G2. But what really grabbed the attention of many players, and certainly this player, was the big reveal that the masterminds behind these giant raids were none other than the Drow; evil, dark elves that lived underground. This elevated the adventure from mere dungeon crawl and searching in giant's bags to a conspiracy. The giant-Drow alliance became Evil with a capital E.
The giants themselves were new-ish monsters then. 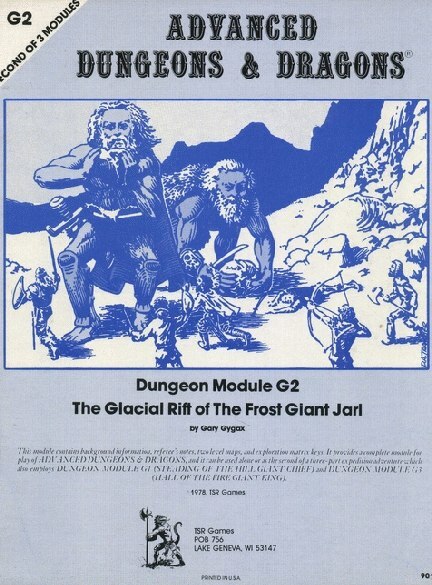 Giants had appeared in the Original D&D rules, but all six races were "detailed" in a paragraph. 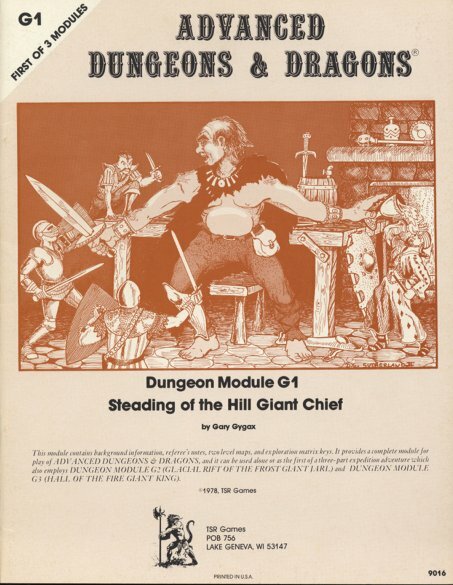 In the (then new) Monster Manual for AD&D 1st Edition giants were given significantly more space and more details. 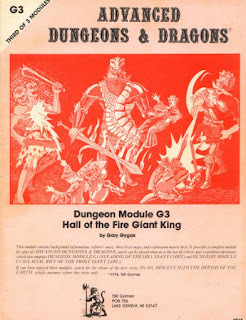 It would be difficult to say which really came first, but we do know that Gygax worked on and published the Monster Manual before the Giants series came out. Notes from one certainly could have influenced the other. What of the adventures themselves? I had the chance to play this as a player way back in the early 80s. So my memories of it are quite fond. So fond in fact that I also ran this adventure with my sons as the players and using the newest edition of the D&D rules. My experiences playing under 1st Edition AD&D compare very favorably to my experiences running it under 5th Edition D&D nearly 40 years later. The 32-page combined adventure splits into three easy parts that represent the three original modules. Here the characters and the players are introduced to the World of Greyhawk, or at least this small section of it. They learn that giants of various types have been raiding the local villages and the character have been pressed into doing something about it. Now the original modules put a threat into the characters to investigate, I find that by appealing to their higher moral codes and motives (and the ability to keep all the treasure) works so much better. Soon the Steading of Hill Giant Chief Nostra is discovered and even a party of 9th+ level adventurers will soon discover that bigger often does mean better. Giants, even Hill Giants, are not dumb monsters. They are not bigger orcs or ogres with more hit points. This is their home and they will defend it. I am quite impressed anytime I think about how this was run as a tournament. 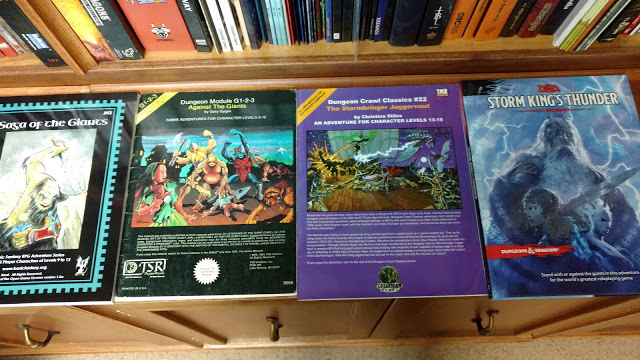 It took me many sessions to get through all three and when I reran for my kids at Gen Con I had wanted to do each one a different night. Didn't happen that way. This adventure requires the players to plan, to hit hard and then run away. Many times they would send in the assassin to take out a giant and then follow it up with a barrage of magic from a distance. Combat can honestly be a slog here. But the action is often very fast paced. There is a lot going on. This adventure shares a lot in common with its sibling B1 Keep on the Borderlands. 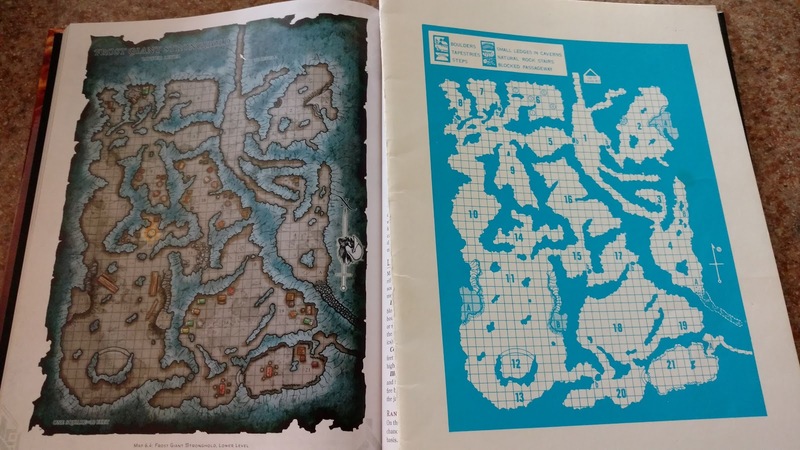 While designed for two different versions of the D&D game, there are similarities that should not be ignored. In fact, I would like to think that they are there on purpose. Each represents a "beginner" view of dungeon crawling, but the Giants adventures, if you pardon the pun, get more advanced. This adventure gives only our first clues to the larger conspiracy, namely that the Hill Giants are taking direction from Giants, quite literally further up. Completing this adventure only leads the characters to the Frost Giants. Going further up the mountains we get the first hints of how the AD&D game is different than the D&D one. We now have rules for cold and the wind and most importantly getting lost in the snow. Like the Hill Giants before, some sections are left to the Dungeon Master to detail. This is partly due to the desire for a sandbox style play and largely due to the tournament origins of these adventures. Again in this adventure planning is required. The characters cannot just rush in blindly and hope to overwhelm these creatures. In fact, assuming they are mere "monsters" is a good way to get killed fast. The Dungeon Master is encouraged to play these giants as the personages they are. Sure, Guard #4 in area 19 might not have a name, but he does have a purpose. Even the white dragon has a purpose. I could not help but think that the white dragon cloak worn by Snurre had not been one of the Frost Giant Jarl's dragons. In fact I hope it was. Their haltered of each other is overridden by the fear they feel at the hands of the drow. How powerful are these dark elves? In this adventure, it should become obvious that much more is going on than raids and attacks of opportunity. There is a force uniting these giant clans and directing to grim purpose. Here the conspiracy is laid bare and the character will discover what and who is directing the Giants. But first they must survive a live and active volcano. The walls, for example, are hot to the touch. How hot? Try 2d6 hp damage per touch hot. The giants here are smart and coordinated by a strong King. They will lay traps and ambushes for the party. They will try to stop them at every turn. This adventure is not only significantly deadlier than the other two, it is also about 50% longer. Not only do the players have coordinated giant attacks to deal with, burning walls and King Snurre himself but also hiding out on level 3 are the drow. For many players back in the day this was their first introduction to the dark elves. I liken it to the big reveal that Romulans were related to the Vulcans in the original series of Star Trek's The Balance of Terror. It is something in our post-Drizzt world that we have lost. Here the Drow are discovered to be pulling the strings, but we don't yet know why. We do that they are lead by a High Priestess, an unearthly beautiful drow by the name of Eclavdra. She is no monster, but an NPC worthy of her own motives, desires and schemes. In the last time I ran this adventure my kids figured out right away that they needed to take out the King in order to not die right away. So they hunted Snurre down. With him out of the way the other fire giants lost their direction and were much easier to defeat. The red dragon and the drow though were still a problem. They managed to kill all but two; Eclavdra and her enchanter. The characters were last seen chasing the drow down to the Depths of the Earth to complete the next series of adventures. While the books are small, the adventures take a while to run. The combats can be long and the characters really should take the time to explore every inch of the three giant strongholds. There is more treasure here than any group of characters need but also there are plenty of prisoners to free and some have information on what is going on. There had been D&D adventures before this, but this was the first epic. There are good reasons why we are still talking about these adventures today nearly 40 years later. Some of it, of course, is just good old-fashioned nostalgia. People loved these adventures then and now they want to share that love with new players today. That is exactly what I did and there is no shame in admitting it. But the reason why people loved them is also the reason why they stand the test of time. The adventures are just plain good. These adventures combined a lot of things that people loved; great locations and sandbox-like play. Iconic and classic monsters mixed with new ones. Not mention an engaging story with memorable NPCs. When gamers wax nostalgic over adventures like Tomb of Horrors, they think of things like the traps or character deaths. In the Giants series they also mention things, like the Hill Giant Chief's dining hall, but also they remember names, like I mentioned above; Ombi, Snurre, Eclavdra. When I played this back in the 80s Ombi nearly killed my whole party. I survived all these giants just to be killed by a Dwarf with some potions and magic item. Well that and a DM that knew how to make a character memorable. Imagine my shock and surprise when my kids plan and take out Ombi in two rounds! This adventure also shaped much of what would become D&D's own mythology. Giants of any sort working together soon became shorthand for bad news. The drow, scantly described here, would go on to become one of the most infamous humanoids in all of the D&D worlds. Their underground city, only hinted at here, would be the template for nearly every Drow-realted product written in the late 80s and beyond to the present day. 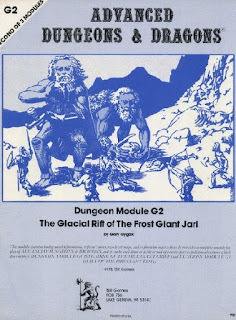 G123 is not just the seed, it is also the fertile earth of much of what would become recognizable as "D&D". TSR and then later Wizards of the Coast would go back to the Giants again and again. In 1987 TSR combined the G series with its sequels the D and Q modules for GDQ Queen of Spiders, one of the first Supermodules. In 1999 they were reprinted and expanded again for the 2nd Edition of the AD&D game in Against the Giants: The Liberation of Geoff. In 2009 Wizards of the Coast released Revenge of the Giants for the 4th Edition D&D game. 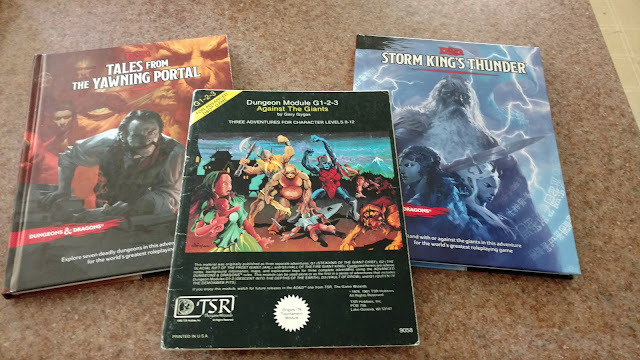 For the 5th Edition game Wizards of the Coast went back not once, but twice, to giant country with Storm King's Thunder (2016) and Tales from the Yawning Portal (2017). Storm King is more a spiritual successor to the original Giants series, but G123's DNA is all over it. Tales from the Yawning Portal is a direct reprint of the original Giants adventures but updated to the new D&D 5th Edition rules with new full-color maps and art. It has lost none of the punch of the original. Not only have there been official Giant-related products from TSR and Wizards over the years, other publishers got into Giant business. Notably there is a "missing" set of giants from these adventures; the Cloud Giants. 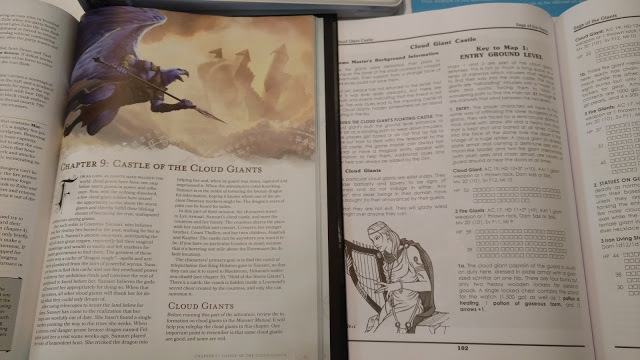 I went to track down a cloud giant based adventure to slot in and easily found 4-5 all based on Cloud Giants. Actually, most of them dealt with a Cloud Giant castle. Think about it, what was one of the first stories you remember hearing as a child? Jack in the Beanstalk might have been one of the very first. The giant living in his castle in the clouds with a goose that lays golden eggs and a harp that sings on its own. Think of the stories from our shared consciousness. Giants living the mountains, David fighting Goliath, Fionn mac Cumhaill and the Giant's Causeway, the Frost Giants of Norse myth, the Titans of Greek myth, to Attack on Titan, and so many, many more. These are the tales we tell. Tales from antiquity to last week's Game of Thrones. It should then be no wonder why these adventures speak to us and call to us to join the battle. 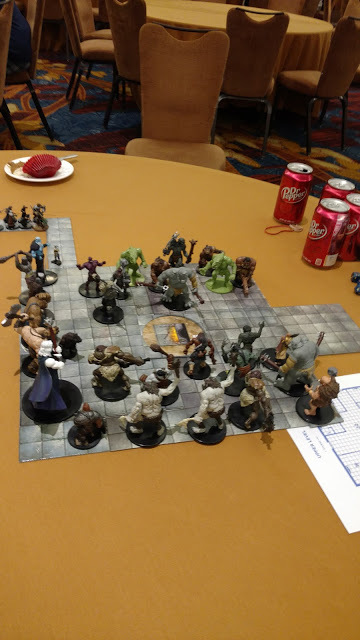 I had the opportunity to run the original 3 modules at a local convention a year or two ago. One of the most important things about the tournament "version" of this (using the PCs that are given in the modules) is that they are dripping with invisibility magic. Potions, rings, cloaks; they're very deliberately given copious ways to go around the giant fortresses unseen. That really changes these modules from a potentially long slog of hit-and-run attacks into a doable single-session adventure. The emphasis changes from large set-piece battles to skulking around, killing and hiding individual giants where opportunity permits, but really trying not to alert the whole place and bring down all of the giants upon them. I played it as a straight combat scenario when I was a kid, but really loved the feel that we got when the PCs were skulking around instead.